This Friday we had everything about bees in the classroom–everything, that is, except the bees! 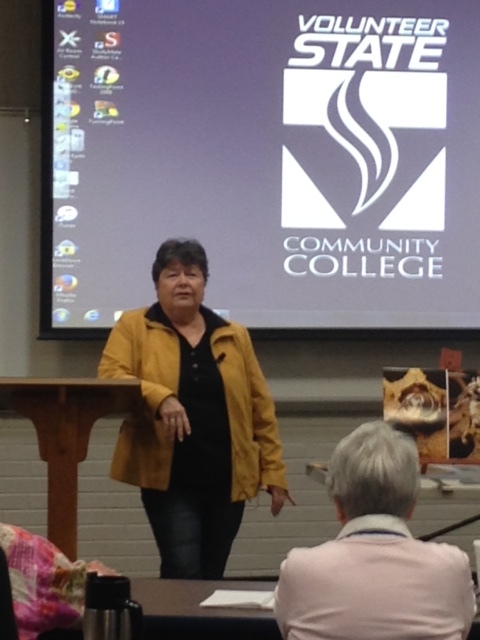 Because of my book, Life Lessons from the Hive, I was invited to Volunteer State Community College in Gallatin to give a lecture on bees and beekeeping. It’s been longer than I care to admit since I’ve been in a college classroom, and never from the front of the room. About 40 people attended the 3-hour classroom lecture. The topic was new for some students. Others clearly had some experience in beekeeping. A few seemed to be interested in becoming beekeepers, while others wanted to know what flowers and trees to plant to help the bees. Everyone was interested in the benefits of using local honey. They kept me on my toes with their many questions. And, yes, I managed to talk about bees (and the Kingdom of God) for three hours. It’s always such a pleasure to share your passions with people who are interested. The lecture series is part of the 6-week KEY Program at Vol State. KEY stands for Keep Educating Yourself. Lisa Haley from the Division of Continuing Education Department described the program. “We have different topics. The key is to keep educating yourself. No matter how old or young you are, you never quit learning.” There are three more weeks left in the program. If you’re interested, you can sign up at https://registration.xenegrade.com/volstate and enter KEY in the search bar.